Peterborough’s main assets are its water and green space. The Otonabee River flows through Little Lake and is part of the world-famous Trent-Severn Waterway linking Lake Ontario to Georgian Bay. In close proximity to downtown, Little Lake is home to the Peterborough Marina, 90 open slips are available for seasonal and transient boat docking. 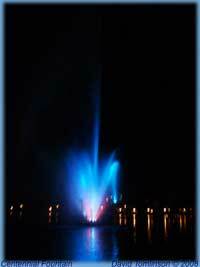 A point of interest is the jewel like presence of Little Lake’s Centennial Fountain which was erected in 1967. The fountain’s powerful jets propel water up over 250 feet into the air while at night its lights project colourful evening displays of sparkling luminosity. The Peterborough Sailing Club offers affordable access to the sport of sailing. Its waterfront property on Clear Lake has the best sailing in the Kawarthas and is just a 25-minute drive from town. The club offers formal training programs for beginner sailors, a schedule of pleasure sailing events, a competitive racing series, and several open regattas for experienced sailors. Geared towards dinghy sailing, boat handling is a breeze with plenty of boat storage, dockage and convenient launching ramp. The club hosts social and family events at its clubhouse that provides a fully equipped kitchen, lounge, deck, gas barbeques, washrooms, and change-rooms. Peterborough Lift Lock 21, a national historic site located on the Otonabee River, rises a vertical distance of 65 feet, its dual lifts are the highest hydraulic boat lifts in the world. Designed in 1896 and officially opened in 1904, the project included many engineering firsts. It was the first lock to be built out of concrete, and at the time was the largest structure ever built with non-reinforced concrete. Remaining in full use today, by a multitude of recreational boaters, the visitor’s centre beside the lock offers interactive simulations and historical exhibits detailing the construction of the lift lock. Many local residents skate on the canal below the lift lock in the winter. On shores of Little Lake, free-admission concerts are presented regularly at Del Crary Park. The biggest annual event is Festival of Lights that features all genres of music and runs every Wednesday and Saturday (at 8 p.m. weather permitting) from late June to late August. The ‘lights’ refer to a stunning fireworks display, choreographed to themed music that illuminates the night sky following every festival performance. The Festival of Trees kicks off each holiday season, transforming the Memorial Centre into a shimmering winter wonderland. For a week in late November, this community-driven event raises funds that support health care in the community. The ongoing total raised has surpassed $4 Million and is testament to the generous and caring efforts of Festival supporters. The annual Snofest winter carnival is a weeklong event held in January. Activities such as Bingo and Euchre tournaments for seniors, a Snopitch tournament, Snofest Soccer, Snofest Idol and Carnival on the Canal all offer outdoor family fun amidst stunning scenery. All season tourism offers exciting recreational opportunities and is an important component of the local economy. Springtime in the region comes alive with maple syrup festivals, sugar bush tours and the beginning of an active fishing season. Summer activities include golf, canoeing, kayaking, boating and swimming. Peterborough offers plenty of organized activities for the sports enthusiast, including the summer slo-pitch league, recreational soccer, baseball and two lacrosse teams, the Peterborough Lakers and Junior Lakers. The city’s Recreation Division oversees activities at 110 sport fields, two City beaches and six wading pools, the Queen Alexandra Community Centre and at the Peterborough Sport and Wellness Centre. Peterborough’s natural amenities, which contribute so much to summer recreation, are equally beneficial when it comes to winter fun. The area is home to cross-country ski trails, a downhill ski facility and a thriving recreational snowmobiling community. Peterborough’s flourishing recreational hockey league involves tots to old-timers and hosts the Liftlock Atom Hockey tournament, one of the largest of its kind in Canada. During winter, Thursday is arena night. Since 1956, the junior ‘A’ - Peterborough Petes hockey club, the longest continuously operating team in both the OHL and CHL, continues to be one of the most successful franchises and in Canadian Junior Hockey. Serving as a training ground for many future NHL stars, the Petes have graduated more players to the NHL than any other junior hockey team. The recent eleven million dollar renovation of the Peterborough Memorial Centre has upgraded the fifty year old building to include 24 luxury box suites, club seating, improved concessions, a licensed restaurant, new seats, boards and scoreboard plus air-conditioning for summer events. Additional arenas include the Evinrude Centre, Kinsmen Civic Centre and Northcrest Arena. The Rotary Greenway Trail is a paved walkway popular for jogging, cycling, rollerblading or just walking the family dog. Built on the former CPR line, it extends from Hunter Street East near the Lift lock, past Trent University and on to the Village of Lakefield. Beavermead Park includes camping facilities and a children’s playground. 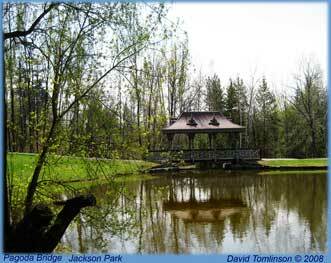 Located on the shores of Little Lake in the east city, the park is on the west side of Ashburnham Drive. Mark S. Burnham Park is located on Highway 7 at the city’s southeast outskirts (the Lansdowne Street extension). Riverview Park & Zoo is open year round and is home to over 40 species of animals. Facilities include a playground, water-park and a miniature train that takes visitors on rides across the river and through the woods during summer months. 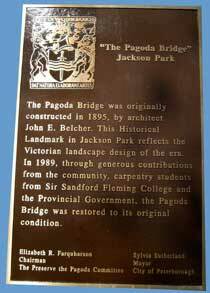 Jackson Park, in the north end at Monaghan and Parkhill roads, features a beautifully restored Pagoda Bridge.